The way the author describes her experience, Hurricane Katrina was a tragedy of biblical proportions. The author’s account reminds readers that God is bigger than any hurricane, any tragedy. 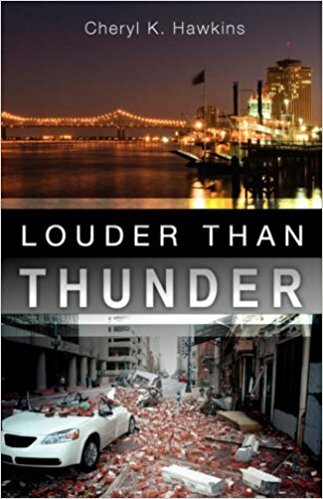 New Orleans born and bred and current Atlanta resident, Cheryl Hawkins, published “Louder Than Thunder” (Xulon Press, 2008), a memoir of faith amid tragedy. It is no ordinary memoir but an extraordinary testimony of the faithfulness, mercy, and grace of God towards the author’s family. Slender and easy-to-read, “Louder Than Thunder” chronicles the author and her family’s encounter with Hurricane Katrina. The title of the book refers to the kind of faith the author possessed, one which helped her survive the ordeal along with her family. Most importantly, her faith also helped her see the bright side of Hurricane Katrina’s wrath. Not only did she witness the bravery of people, ordinary folks like herself– rescuing neighbors from the flood, but also the resolve of residents to maintain their dignity and humanity in the most inhumane of circumstances. Faith opened her eyes to believe God is always present in the midst of tragedy and He is bigger than any tragedy. “Louder Than Thunder” is available at Xulon Press and Amazon. Cheryl Hawkins was born and raised in New Orleans, Louisiana. She graduated from Oral Roberts University in 1982 with a Bachelor of Science Degree in Telecommunications. She later attended graduate school and obtained a Master’s Degree in Education from the University of New Orleans in 1992 and has been an elementary school teacher for over thirty years. She has spent forty-five years of her life living in New Orleans, being active in her church and participating in several outreach ministries across the city. However, on August 29, 2005, Hurricane Katrina changed all that! Once she was rescued, she realized that she would never again return to the life she once knew. She now resides in suburban Atlanta, Georgia with the rest of her family members. The book, “Louder Than Thunder,” is a culmination of experiences that she wrote about in her diary as she encountered the storm.